Competition is a negative interaction that occurs among organisms whenever two or more organisms require the same limited resource. All organisms require resources to grow, reproduce, and survive. For example, animals require food (such as other organisms) and water, whereas plants require soil nutrients (for example, nitrogen), light, and water. Organisms, however, cannot acquire a resource when other organisms consume or defend that resource. Therefore, competitors reduce each other's growth, reproduction, or survival. Biologists typically recognize two types of competition: interference and exploitative competition. During interference competition, organisms interact directly by fighting for scarce resources. For example, large aphids (insects) defend feeding sites on cottonwood leaves by kicking and shoving smaller aphids from better sites. In contrast, during exploitative competition, organisms interact indirectly by consuming scarce resources. For example, plants consume nitrogen by absorbing it into their roots, making nitrogen unavailable to nearby plants. Plants that produce many roots typically reduce soil nitrogen to very low levels, eventually killing neighboring plants. Species also interact with other species that require the same resources. Consequently, interspecific competition can alter the sizes of many species' populations at the same time. Experiments demonstrate that when species compete for a limited resource, one species eventually drives the populations of other species extinct. These experiments suggest that competing species cannot coexist (they cannot live together in the same area) because the best competitor will exclude all other competing species. Why then do communities seem to have many competing species that coexist in the same area? To explain how species coexist, in 1934 G. F. Gause proposed the competitive exclusion principle: species cannot coexist if they have the same niche. The word "niche" refers to a species' requirements for survival and reproduction. These requirements include both resources (like food) and proper habitat conditions (like temperature, pH ). Gause reasoned that if two species had identical niches (required identical resources and habitats) they would attempt to live in the exact same area and would compete for the exact same resources. If this happened, the species that was the best competitor would always exclude its competitors from that area. Therefore, species must at least have slightly different niches in order to coexist. Peter Grant and colleagues tested Gause's principle by studying seed-eating finches (birds) that live on the Galapagos Islands in the Pacific Ocean. They found that different finch species can coexist if they have traits that allow them to specialize on particular resources. For example, two finch species, Geospiza fuliginosa and Geospiza fortis, vary in a key trait: beak size. Beak size is a critical trait because it determines the size of a seed that a finch can eat: Individuals with small beaks eat small seeds, individuals with intermediate sized beaks can eat intermediate size seeds and individuals with large beaks can eat large seeds. G. fuliginosa and G. fortis do compete for intermediate sized seeds because each species has some individuals with intermediate sized beaks. However, G. fuliginosa specializes upon smaller seeds because it has more individuals with small beaks. Conversely, G. fortis specializes upon larger seeds because it has more individuals with large beaks. Thus, these species niches differ slightly because a specific trait, beak size, allows them to specialize upon a particular seed size. Joe Connell also tested Gause's principle by studying barnacles (shelled marine organisms) that live on rocks along European coastlines. In 1961, Connell found that two barnacle species, Balanus and Chthamalus, can coexist because they differ in two traits: growth rate and vulnerability to desiccation . Balanus 's growth is rapid, which allows it to smother and crush the slower-growing Chthamalus. Balanus, however, dies close to shore because it gets too dry during low tide. In contrast, Chthamalus tolerates these dry conditions. Consequently, even though Balanus is a better competitor for space, these barnacles coexist because Chthamalus can survive in areas that Balanus cannot survive. These and many other examples support the competitive exclusion principle: Species can only coexist if they have different niches. Competition can cause species to evolve differences in traits. This occurs because the individuals of a species with traits similar to competing species always experience strong interspecific competition. These individuals have less reproduction and survival than individuals with traits that differ from their competitors. Consequently, they will not contribute many offspring to future generations. For example, the finches previously discussed can be found alone or together on the Galapagos Islands. Both species' populations actually have more individuals with intermediate-sized beaks when they live on islands without the other species present. However, when both species are present on the same island, competition is intense between individuals that have intermediate-sized beaks of both species because they all require intermediate sized seeds. 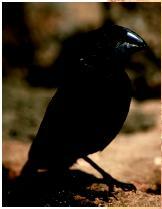 Consequently, individuals with small and large beaks have greater survival and reproduction on these islands than individuals with intermediate-sized beaks. A ground finch on Santa Cruz Island in the Galapagos. Different finch species can coexist if they have traits—for instance, beak size—that allow them to specialize on particular resources. Studies show that when G. fortis and G. fuliginosa are present on the same island, G. fuliginosa tends to evolve a small beak and G. fortis tends to evolve a large beak. The observation that competing species' traits are more different when they live in the same area than when competing species live in different areas is called character displacement. For the two finch species, beak size was displaced: Beaks became smaller in one species and larger in the other species. Studies of character displacement are important because they provide evidence that competition plays a very important role in determining ecological and evolutionary patterns in nature. Connell, Joseph. "The Influence of Interspecific Competition and Other Factors on the Distribution of the Barnacle Chthamalus stellatus. " Ecology 42, no. 4 (1961): 710–723. Gause, G. F. The Struggle for Existence. Baltimore: Williams & Wilkins, 1934. Grant, Peter R. Ecology and Evolution of Darwin's Finches. Princeton, NJ: Princeton University Press, 1986. Wedin, David, and David Tilman. "Competition Among Grasses Along a Nitrogen Gradient: Initial Conditions and Mechanisms of Competition." Ecological Monographs 63, no. 2 (1993): 199–229. Whitham, Thomas G. "Costs and Benefits of Territoriality: Behavioral and Reproductive Release by Competing Aphids." Ecology 67, no. 1 (1986): 139–147.